The report "Mold Release Agents Market by Type (Water based and Solvent based), by Application (Die Casting, Rubber, Concrete, Plastic, Food Processing, Papers, & Others) and by Regions - Global Trends & Forecasts to 2020", is expected to reach USD 1.5 Billion by 2020, at a CAGR of 6.1% between 2015 and 2020. The market is expected to drive by the rapidly growing automotive and construction industries. Browse 88 market data tables and 60 figures spread through 148 pages and in-depth TOC on "Mold Release Agents Market by Type (Water based and Solvent based), by Application (Die Casting, Rubber, Concrete, Plastic, Food Processing, Papers, & Others) and by Regions - Global Trends & Forecasts to 2020"
Environment friendly and Zero VOC emission: The mold release agents’ market report is segmented by types, namely, water based release agents and solvent based release agents. Water based release agents holds the major market share in global mold release agents market. The factors driving the mold release market for water based release agents are its properties such as environment friendliness and zero VOC emission. Growth of end-use industries: The mold release agents market is also segmented on the basis of applications. The major applications of mold release agents market are die casting, rubber, concrete, plastics, food processing, paper, and others. The die casting application segment is leading the mold release agents market due to its wide scale usage in the rapidly growing automotive and construction industries. Another major factors driving the growth of mold release agents is its increase use in manufacturing industries. Growing industries in emerging economies: The mold release agents market is broadly segmented into four regions, i.e. North America, Europe, Asia-Pacific, and Rest of the World. North America is the largest market for mold release agents followed by Europe. Asia-Pacific is expected to be the fastest-growing market during the forecast period. The major factors driving the mold release market in Asia-Pacific is growing industries in emerging economies like China and India. 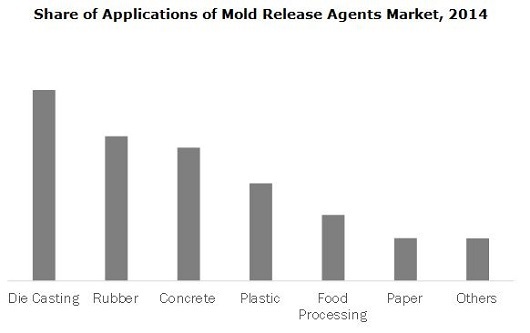 Currently, the global mold release agents market is dominated by various market players such as Chem-Trend L. P. (U.S.), Henkel AG & Co. KGaA (Germany), Wacker Chemie AG (Germany), Croda International Plc (U.K.), Michelman Inc. (U.S.), Cresset Chemical Company (U.S.), Daikin Industries (Japan), MCGee Industries, Inc. (U.S.), and others. The research study is aimed at identifying emerging trends and opportunities in the global mold release agents market along with a detailed classifications of the market, in terms of revenue and volume. It provides a comprehensive competitive landscape and identifies the key players with respect to market size and market share. The research study also includes a detailed segmentation of the global mold release agents market on the basis of application, type, and geography. Apart from the market segmentation, this report also adopts the Porter’s Five Forces Analysis to provide an in-depth analysis of the market by providing a detailed process flow diagram and market dynamics such as drivers, restraints, and opportunities in the global mold release agents market.